(and to go see Top Gear). I'll be staying in Haymarket. Does anyone have any restaurants and artisan/craft markets to recommend? I already have plans to go to Bodhi, and I loooove Iku. On Thursday I had to brave the hordes going late night shopping, as I tried to find new clothes for Chinese New Year. My parents have been known to be some of those hordes, so I met up with them and my sister for dinner at Chatters restaurant, just outside Morley Galleria. It was standard pan-Asian food, leaning slightly towards Thai but still with that Malaysian-Chinese bent that is so common in Perth’s Asian restaurants. 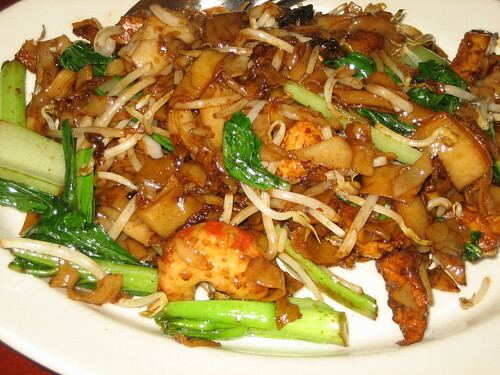 We ordered a char kuay teow, slightly oily and not quite enough vegies for my preference, but still pretty tasty. The waitress assured us that the sauce for the satay vegetables was shrimp and fish oil free, so we ordered that. There was a wide array of delicious vegetables involved, baby corn and bok choy and bamboo and carrot and lots of my favourite things, and that was pretty tasty. 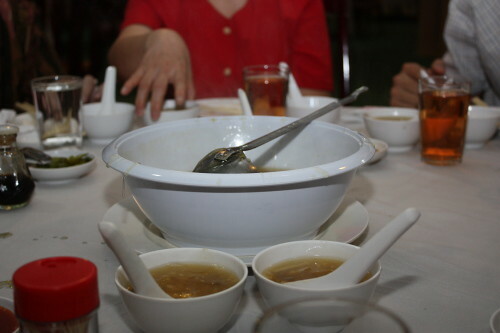 We also ordered a claypot vegetables (a little cornstarchy but overall okay) and some spring rolls. The spring rolls were not my thing, very OTT with the pepper filling, but my sister seemed to quite like them. 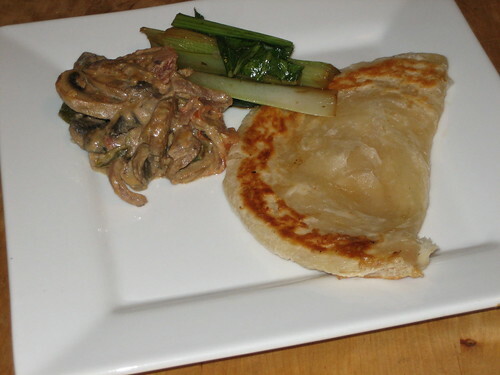 On Friday I tried this mushroom masala recipe, and added some gailan in soy sauce as a side. I was so intrigued, it sounded like a great combination, but ultimately the flavour was too rich for me, and I had to cover it with my gailan in order to disguise the strong flavour. I’m not sure what created this, perhaps the addition of tahini. At least my roti was very delicious, as always. On Saturday I ventured Very North to A Curry Affair, an Indian restaurant in Malaga. 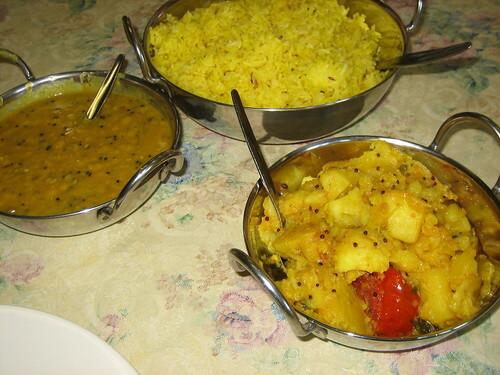 All the vegetarian curries they had on for the evening were vegan, so we tried the dhal, a potato curry and, at their insistence, the vegetable sambal. The dhal was okay, the potato was pretty good and sambal was awesome. Price was okay, but it was in Malaga. D was away in Tasmania last week for lca, so I had seven days of Single Penguin Food. I had the best intentions of lots of new to me things, and I managed to pretty much stick to this, but I also had the best intentions of no take out or restaurants. This last was not so strictly adhered to, as I was distracted by family members, pizza with C + E, curry with my sister, noodles with my parents. I spent Sunday curled up on the couch, mainlining Merlin. What a ridiculous show! I ventured out of the house at the last minute, as I realised I had no noodles suitable for claypot (which I blogged about in detail here). Monday night I tried this Moroccan cauliflower recipe. It was not great. 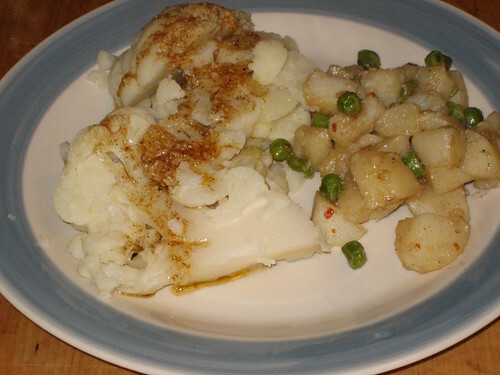 The steamed cauliflower was okay, but the flavour wasn't as strong as I'd thought it was, and in the end it was just some steamed cauliflower with a bit of cumin. I added a side of aloo muttar, because I'd been worried the cauliflower wouldn't be sufficient, and I was glad I added it. Mixing the potatoes together with the cauliflower made dinner pretty tasty. Tuesday night I hung out with D's brother C, his partner E, and E's brother and brother's girlfriend. We played my new favourite game, and had pizza from East End Pizza, in East Perth. East End lets you make your own pizza, and on Tuesday nights all MYO large pizzas are $12, and that was pretty awesome. 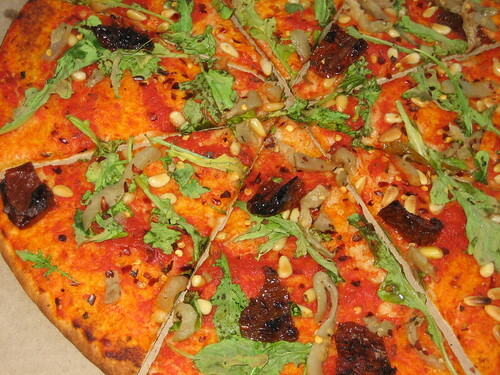 I had eggplant, chili flakes, sun-dried tomatoes, pine nuts, and spinach. 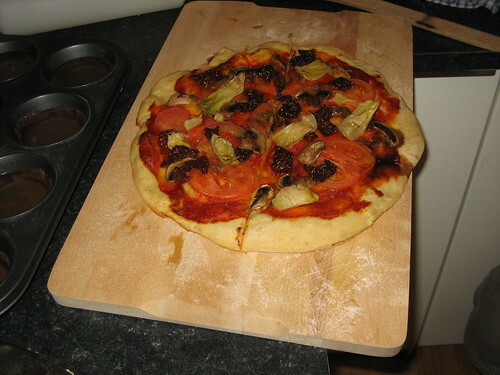 The flavour was fantastic, though a little dry, and I wish I had added normal tomatoes. It was pretty great though! Wednesday night I was suffering from cramps and feeling sulky, so I had my #1 comfort food, noodle soup. It is the best, easy and it has been my favourite since I was a child, it brings me such delight and comfort. Stay tuned for days five through seven! don't pick up a jar of sundried tomatoes by the lid. the lid will fall off, scattering oil, glass and smelly tomatoes all over your floor, and it will be all your fault. and also you will have to mop your floor in the middle of chinese new year, and that's not good. Part of the joy of Chinese New Year is the treats we get, once a year sweets that are sugary and floury and coveted and difficult to make. I tried to make some kuih for the first time this year, they were a bit average but I've still got twelve days to go so that's plenty of time to try again. A lot of kuih is vegan, except for that critical last second when an egg wash is used to give it that gloss. This year I discovered my very favourite lollies contain egg whites (no! ), and all the great looking peanut cookies had an egg wash. The pineapple tarts were egg free, though, and delicious as always. Love letters are my very favourite Chinese New Year treat. 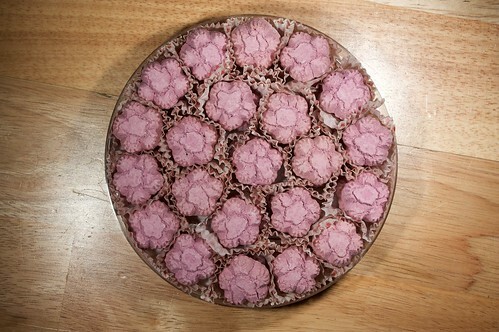 A batter is poured into hot iron moulds, they're difficult to make but the end result is a crispy wafer treat. I'm no where near ready to try making these kuih kapit, so it's a good thing they're readily available at Chinese New Year. Kuih bangkit are a chalky coconut biscuit that disintegrates in your mouth. My mum usually buys the white ones, as a child they used to be shaped like birds with a little red dot for the eyes, and as a result my sister and I used to refer to them as death biscuits. I love their deliciousness, but they make your mouth stick together and I do wish they weren't quite so chalky! I love this time of year, all the delicious treats and so much food. I wish some of these treats were available all year around! 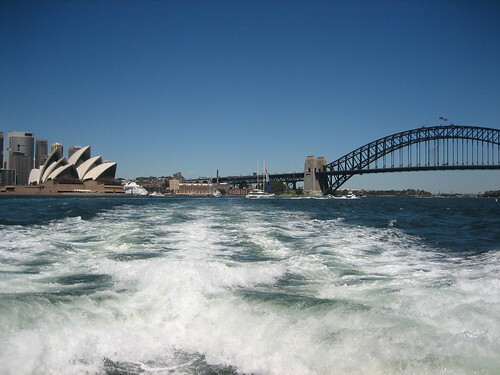 Not only was yesterday the first day of Chinese New Year (YAY), but it was also Australia Day. 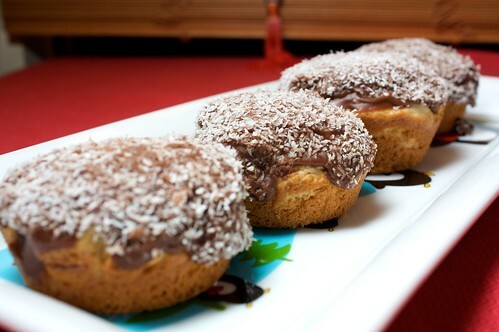 I mostly did CNY things, but I did also bake some lamington cupcakes, because lamingtons are one of my favourite snacks ever, and one I've not had in years. I used to love buying them from the local bakery on the way to school every morning, if I was very lucky they'd have the ones with the chocolate sponge, they were fantastic. I also used to love the fundraising drives, where you'd order a box or five of delicious, soft lamingtons, and mum would always put at least a box in the freezer, to save for darker, less delicious days when there were no fresh lamingtons to be had. I baked these as cupcakes because I wasn't sure how the recipe would hold up as a sponge cake, especially as I saw several vegan sponge recipes that were all "it will fall apart!" And it seemed to work for Carla a few weeks ago. They were satisfying, but I think I'm ready to give proper lamingtons a go, because they really do need to be six sides of deliciousness. Cream together the sugar, applesauce and butter. Combine with sifted flourand baking powder. Slowly mix in the milk. Divide in to twelve cupcakes, and bake at 180C for 17 minutes. Leave to mostly cool. 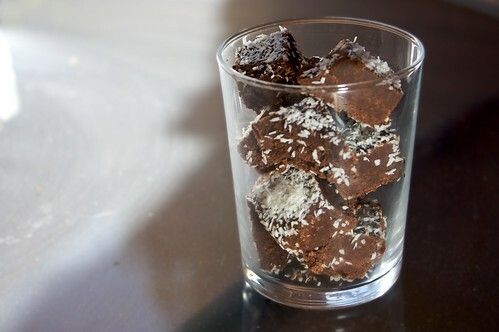 Whilst cupcakes are mostly warm but heading towards cooled, dip in chocolate mixture (leave to soak for thirty seconds to a minute), and coat in desiccated coconut. You may need to cool in the fridge for half an hour to solidify the chocolate, depending on the ambient temperature. In Perth yesterday it was pretty warm! Mix together until suitably runny. Dressed in our super ang-y best, last night we went to my parents' house for reunion dinner, as is customary on Chinese New Year's Eve. The foods we eat for Chinese New Year have meanings beyond it's traditional; we eat noodles for longevity, and fish, as always, for abundance. The meal is loud and messy, and the table is always crowded with old friends. Unlike with Christmas, my problem since going vego has not been "what do I eat? ;" rather it has been the removal of the ability to share everything, every person taking a little from each dish, yelling across the table and throwing the scraps beside one's bowl. 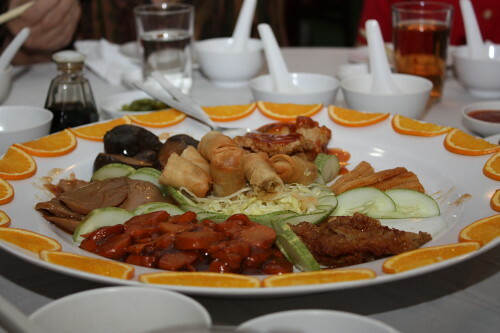 This year my sister and I pushed together several tables to make the biggest table ever; my mum cooked a dozen dishes, half of them vegan and half of them not; and this was an awesome way to do it, being able to share with everyone so many dishes, and finally I felt like it was a proper CNY reunion dinner. 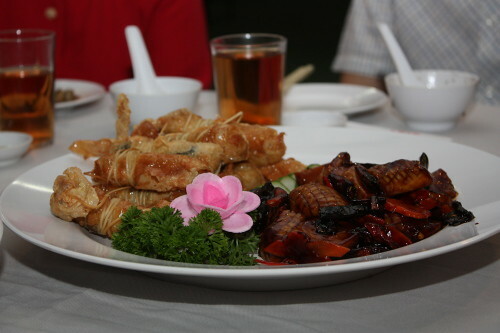 There were noodles, and claypot vegies, and mock fish and crispy chicken and some mushrooms with gailan, and fresh mango and grapes and it was the best. 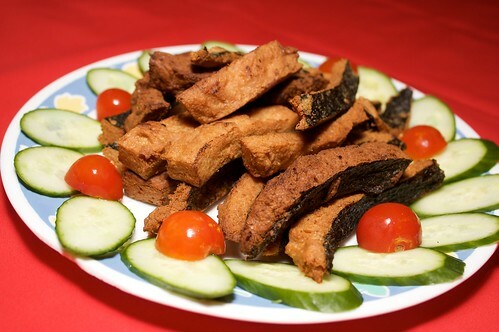 I am not a giant fan of mock meat, but it is for things such as this that it was invented, for these traditional banquets where the way you say it means everything, and I am just glad that they were incidentally tasty, and in the end there was no mock meat left because everyone had eaten it all. The photos didn't work out fantastic, I was busy cooking and D was busy with jetlag, but you get the idea. 恭喜发财, happy new year and also happy Australia/invasion day. what to do when your bread fails to rise? I made my very first attempt at making bread from scratch last week! 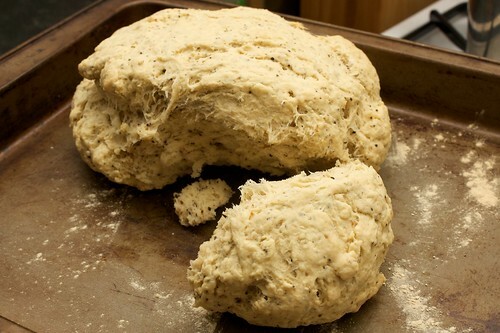 It was the rosemary bread in Veganomicon, and the yeast totally failed to activate. I don't know if this is because I used standard yeast from the shops and the recipe calls for activated, or if the recipe just fails to note this (I am at work), but yes, it was a gigantic failure. I didn't want to just throw the dough out, so we made pizza instead, and that worked great. The pizza needed to be in the oven for about twenty minutes at 190C, it crisped up really well. And I'm glad to know failed bread works for pizza base, because there's more bread making in my future, and it's nice to have a fall back if it turns in to more fail bread. My sister loves claypot. I am amenable to claypot, but I’ve not had it a lot, always having given preference to chicken rice and laksa and noodle soups and things. A week or two ago I had claypot at Utopia and it was disappointing, the soup thickened with cornstarch and the flavour sort of bland. 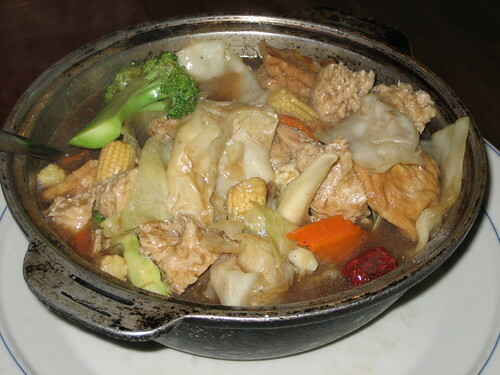 Claypot is at its best when the soup is rich and well-flavoured, but not strongly flavoured. This is more of a cheater claypot than anything, and I had planned to submit this to No Croutons Required, except by the time I was finished it was more like noodles and vegetables in sauce than the required vegetables in soup. The joy of a claypot is in the soaking, as the claypot bakes, the juices and sauce soak in to the contents of the claypot, covering and filling everything with a thick, tasty gravy. 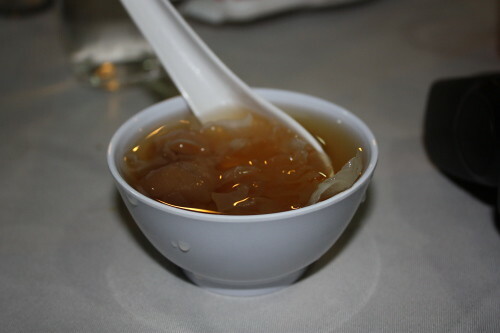 To that end, I like to use wonton noodles because of the way they soak in the sauce. 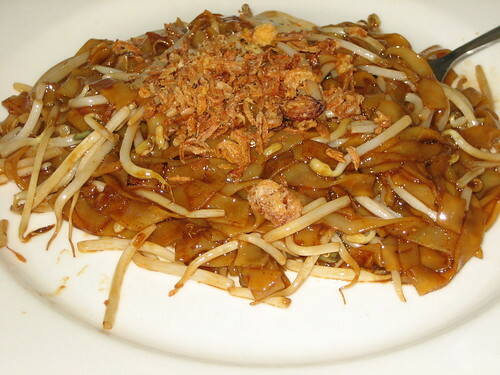 Try to avoid rice noodles, as they will fall apart during extended soaking process. Prepare the wonton noodles. Don’t over cook them! 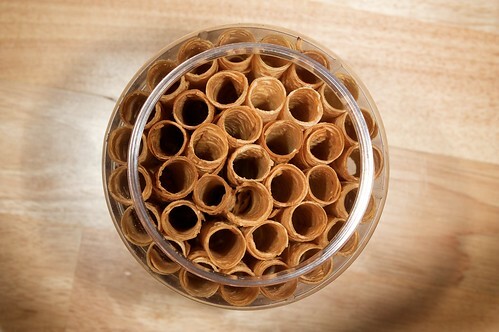 When they are ready, remove from heat, submerge in cold water, then drain. 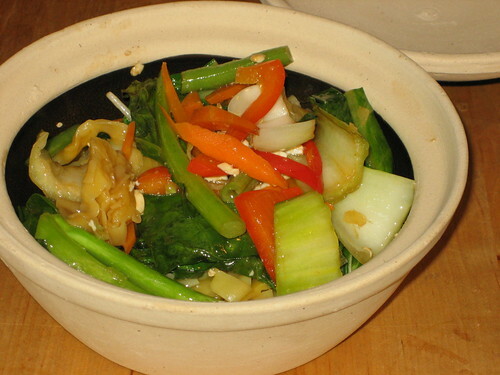 Put in claypot, put bean shoots on top, and shake in a dash or two of oyster sauce and a little pepper. Mix through. In the meantime, in a little peanut oil fry the shallot and the ginger. Add the garlic, chilli, capsicum, beans and carrot. After frying for a minute or two, add a teaspoon of water to the wok, then cover with lid. After five or so minutes, or when the beans have started to soften, add the kai lan stalks and some extra water if necessary. Cover again with lid for another few minutes, then add kai lan leaves and tofu, as well as a dash or three of oyster sauce, a dash of dark soy, and some sesame oil. Add lid again, leave for five minutes. Pour entire mixture into claypot, as well as about a cup of stock. Mix all ingredients together. Bake in oven at 190C for 20 minutes. Utopia has been an old vego standard here in Perth town, with its delicious all-vegetarian foods and its great karaoke screens and its bubble tea, fuelling the sago obsession in this town. Being long settled in Northbridge, it's a constant late-night haunt and, rarely being closed, it is ideal for those conventions that take you in to Northbridge for four days over long weekends, when no other restaurant is open. 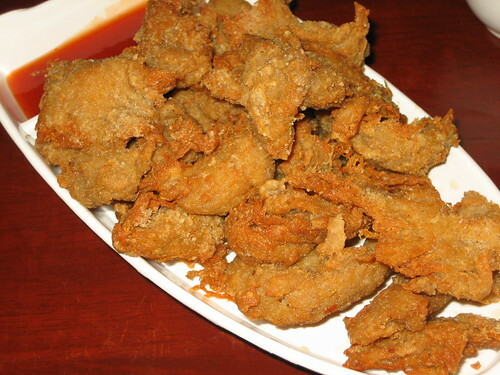 It is not fantastic, and it is not high cuisine, and it can be a little on the pricey side, but it is old faithful, and its mushrooms are delicious. You grab yourself some tea and/or some water, some bowls and chopsticks, and a couple of menus. There are little forms and pens to use, and you write your the menu items down by number, before paying and ordering up at the counter. This makes dividing the bill pretty easy, but it also means you need to pay attention that you don't write down the wrong letter and end up with a steak and chips or something. Vego restaurants are so thin on the ground in Perth, it's nice to go with a whole bunch of vego (or vego-friendly) friends and share a range of dishes, some new and some incredibly familiar. 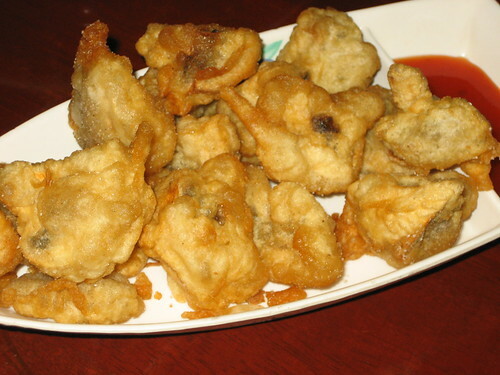 The Hou Tou Mushrooms are one such old standard, deep fried spice mushrooms, and the attending cashews are delicious. Liz introduced us to this dish, and we order it quite often. About a year ago there were rumblings that the fake-meats at Utopia (and also at Lotus) were not vegan, as they contained whey. Some research has given me confidence that so long as we stick to the "white meat" products, avoiding beef and pork, and also things like prawns, then we are okay. For vegan-safety, I'll probably check again when we hit twelve months, and keep doing so for so long as they keep stocking vegan-unfriendly mock meats amongst the stuff suitable for vegans. I do, however, prefer the less mock-meaty dishes. Mock meat serves its purpose, but I continue to believe the best stuff is mock-meat free, just delicious fresh vegetables and tasty broths and wonderful spices. 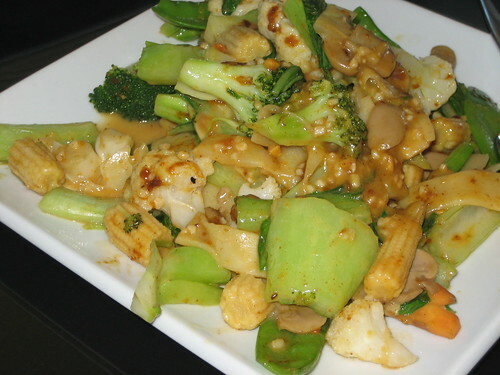 On this particular visit, we had the tofu and vegetable curry, the char kuay teow, the hou tou mushrooms, the crispy fried mushrooms, the salty fried chicken and a chicken claypot. 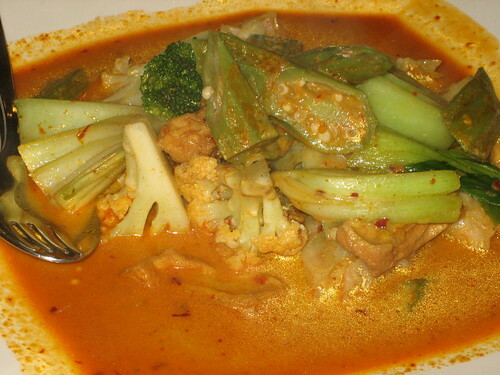 The tofu and vegetable curry suffers from the same problem as all of Utopia's curries, that is that it is exactly the same as all the other ones. The flavour of the gravy is just fine, but there is no change and that makes it a bit boring. 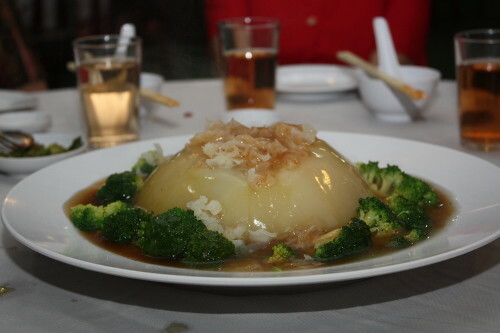 The claypot was not great, clearly very thick with cornstarch and possibly a little msg. 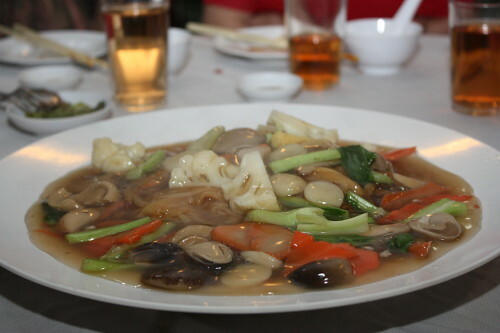 Utopia's kuay teow is servicable, the salty fried chicken was just fine, and the hou tou mushrooms and the crispy fried mushrooms are the reason why we go there so often, and they were exactly as we expect them to be. When I visit my parents I tend to get loaded up with fresh vegies from out in the Swan Valley, crisp gai-lan and bok-choi and so on. Last week my vegie loot included half a cabbage, and as the week progressed I was unsure what to do with it. 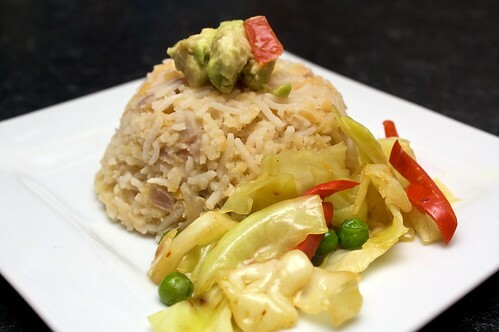 For some time I'd been considering trying a kedgeree, sort of like a pilaf only not really, but I thought it sounded a bit plain so cooked up a cabbage curry to go with it. I'm not totally happy with the kedgeree, so no recipe, but I'm very happy with the cabbage curry. It was very easy and quite quick, and added a great extra flavour to the kedgeree. Shred the cabbage. 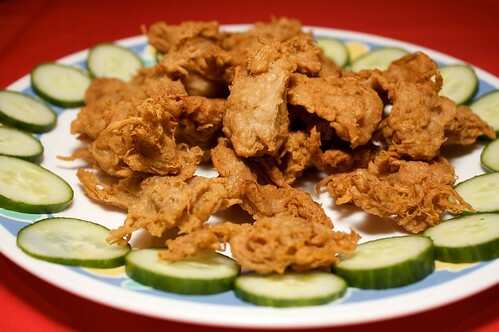 Fry in wok in a little peanut oil until for a few minutes, until it starts to colour and soften. Add sliced chilli, and tumeric, cumin, chilli flakes, coriander and pepper. Toss through, pour in a tiny amount of water (one or two tablespoons), and put lid on wok. The water allows the cabbage to steam in the spices. After a few minutes, check the cabbage, and toss if necessary. Continue until cabbage is almost cooked through. Add peas and mustard seeds, and a dash of extra water if necessary. Leave to fry another minute or two, until peas are heated through and there is no liquid left in the wok. This combination of spices is a little bit spicy, particularly as there is nothing to really temper it. This baked cheesecake from My Sweet Vegan was so great I made it twice this week: once for a test, and once for D's last day at Old Job. I've never been a huge fan of cheesecake, and this is the first one I've tried in about ten years, and definitely the first one since I've been vegan. It was great! A bit melty in the heat, but a delicious combination of spices gave it a really great flavour, and somebody even asked D for the recipe. Second Wedding Banquet, at the Jade Palace, in Georgetown, Penang. 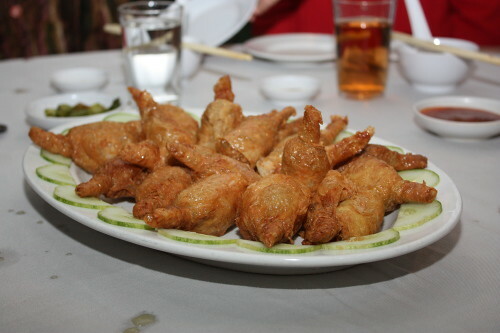 The joy of a Chinese wedding is all in the eating. 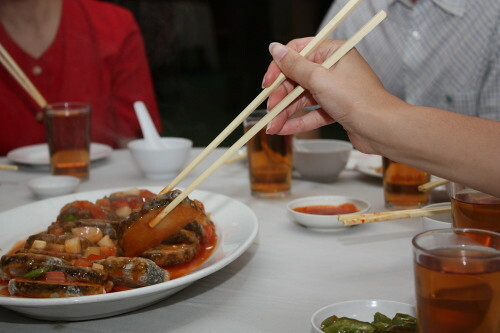 It is a fast affair, everyone serving from the middle using their chopsticks, except in the instances of soup. 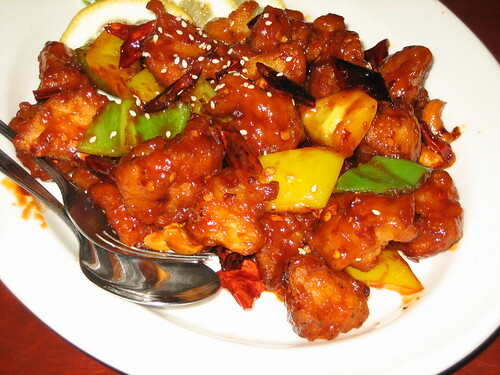 Every dish has a meaning: red chicken stands for good life; the soup, for wealth. Melon has something to do with taking the bitterness away or something, I can never remember. We ate a full eight courses, every one of them strict vegetarian (or, as we call it in Australia, vegan). I used to love sausage rolls. They're one of those things you love as a kid, they're essential at parties (along with the ubiquitous party pies and delicious fairy bread), with their flaky pastry. They're available at every tuck shop and canteen, and just about every bakery. Where I work, they're also essential when you're putting on morning tea, even if morning tea is at 09:30. 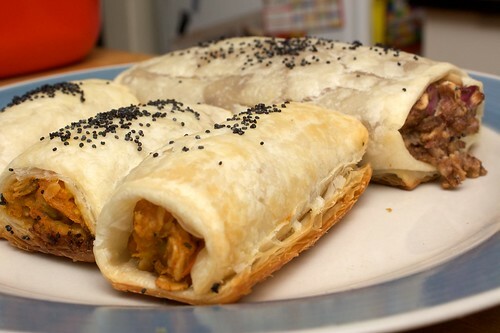 Having had an excellent start to the new month regarding new techniques and things, and casting about for something to make for dinner, I thought I'd give these two recipes a go, Cindy's vegan sausage rolls and Vegetation's veggie rolls. I stuck moderately closely to the recipes, unsure how they were going to turn out. With Cindy's recipe I had to skip the bread crumbs, as I didn't discover until my return home that the bread was mouldy (yuck!). I didn't quite have 125g of pecans (and they were a bit soft and stale), and I probably only used half a (red) onion. I also used fresh garlic rather than ground. I bamixed as well as I could, given my eyes started watering, then rolled the most gigantic rolls ever and sat them on a baking tray in the fridge whilst I prepared the other rolls. With the vegie rolls, I skipped the corn kernels, which D loathes, and used only half an onion. As an egg replacement I used a few spoonfuls of apple sauce. Waiting for it to cool was the worst bit, knowing that I had all these sausage rolls waiting to be baked. Used the borg's puff pastry for all of these, brushing them with some soy milk and sprinkling poppy seeds on the top. I baked them all together (two trays worth) at about 225C for 40 minutes or so. D enjoyed the vegie rolls the best, whilst I am undecided. The sausage rolls were pretty awesome, but they did have a certain disturbingly "meaty" quality to them, which we found a bit disconcerting. But I would be happy to make both of these again in the future, they weren't too difficult and I love making things using puff pastry. I love pesto. It makes a great addition to many things, I love spreading it across lasagna sheets for a richer flavour. It's really easy to make, too. Lots of oil and whatever you like best, I like to make a basil and pine nut pesto but I'm looking forward to giving a sun-dried tomato pesto a go sometime soon. 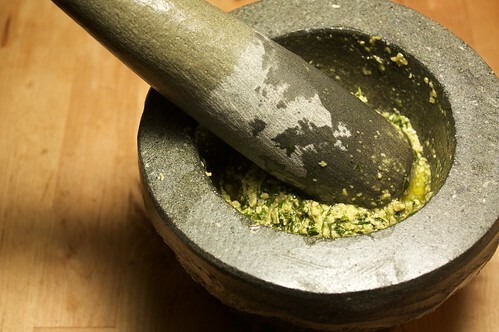 I know many people use a food processor for their pesto, but I prefer to use my mortar and pestle. If you've never made it before it's easy, two handfuls of basil leaves, no stems, a whole lot of pine nuts, some pepper if you're in to that sort of thing and then gradually a whole lot of olive oil, until you're happy with the consistency (continuously pounding/processing). For a warm summer evening, a little pesto tossed through some pasta is a quick, easy way to make dinner without sweltering in a tiny kitchen. 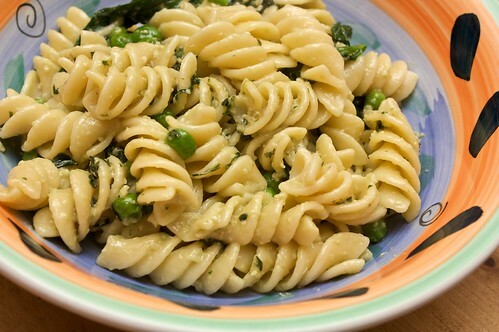 For the pasta below I added about a half a cup of frozen peas to the pasta in the last minute or so of cooking, and wilted a handful of baby spinach by rinsing them in the colander and draining the pasta over the top of them. Quick rinse through, then back in the pot to toss the pesto through. The pesto was very creamy, I think it was the masses of oil I pounded in to it. The only problem with pesto pasta for dinner is that I find it tends not to reheat so well the next day, so it's not great for taking to work. D, trying to impress me with a knowledge of vegan sweets and cookbooks that is better than mine (a challenge), gave me Hannah Kaminsky's My Sweet Vegan for Christmas, as well as seasons one and two of La Femme Nikita. But I can't bake anything from LFN, so on Sunday I cracked open My Sweet Vegan instead to find a tasty vegan treat. The five minute coconut fudge looked very appealing, both for its lack of oven (it was a hot day) and the promised speed with which it could be conjured. It was fantastic! 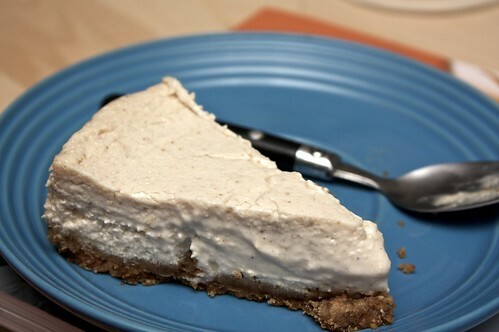 A delight to eat and easy to make. It was my first try making fudge but it definitely won't be my last. "I'm getting much more adventurous with vegetarian cooking," my mum said, which was news to me, because she's already pretty fantastic with her vegetarian cooking. This bodes well for me and D, especially as we are now at T-19 sleeps until the big feast and mahjong party on the eve of Chinese New Year. Wandered out to my parents' house on Sunday afternoon, stopping for an icecream at the Junction Icecreamery on the way. I got passionfruit soya and chocolate soya, which is always the best. It's nice to be living that little bit closer to my parents, but I did need to stop for the snack because it's still a forty minute drive! Mum as always cooked a lot of great dishes, all of which were vegan! 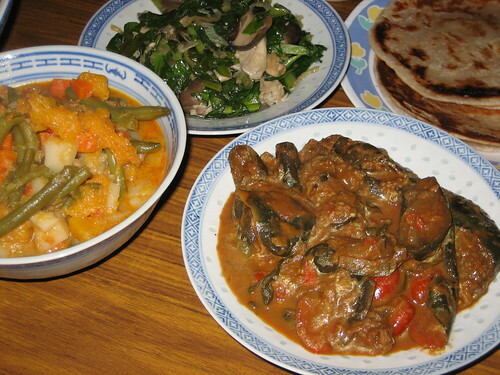 The pumpkin curry is one of my favourites, sometimes quite spicy and sometimes just flavoursome without a heavy bite, usually heavy with potato and snake beans. 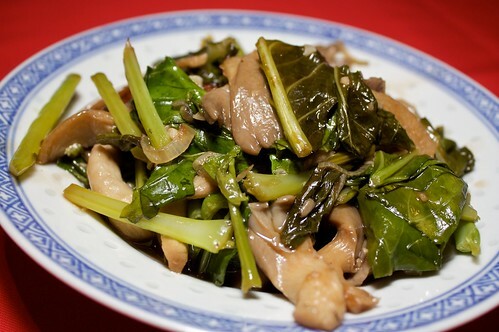 The gai-lan and mushroom dish featured three sorts of mushroom. The roti was the usual delicious flakiness. Finally, there was a moderately spicy eggplant curry, very creamy in texture and super tasty. Dessert was a fruit salad of melons, stonefruit and grapes, with an assortment of icecream from the Junction. Then I had to do the dishes, but it was worth it. New Year's Day was a bit warm, and the house was stifling, in part due to the damper I'd baked for lunch and the pancakes I'd cooked for breakfast. I decided an easy, lazy summer dinner was in order. Deciding to make potato and gravy with some sweet potato chips was perhaps not the best idea for a warm summer evening, given the oven was then on for a good forty minutes. Still, it was delightful and easy, and it was exciting to eat potatoes and gravy for the first time in years! 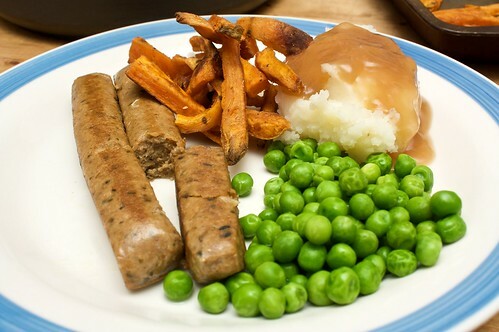 We had delicious sausages and some peas rounding out the meal (and an attempt at nutrition). We've been using the Orgran's gravy, with D in charge of gravy stirring. It congeals fairly quickly after it comes off the heat, but it served just fine, and, though it is a little transparent it tastes pretty good. 3 tablespoons or so of olive oil. Peel the sweet potatoes, and cut in to chips. I like to make mine about a half cm across and about ten to fifteen centimetres in length. Combine all the other ingredients, and stir through the potatoes until well coated. Bake at 230C for about forty minutes, turning halfway, until firm and crispy. I was really excited to hear that Tiamo had added a vegetarian big breakfast to their menu. Tiamo has been the hangout of The Breakfast Club for several years now, being central up until six months ago, and with the return of A to Australia after twelve months adventuring, we thought we'd give it a go. 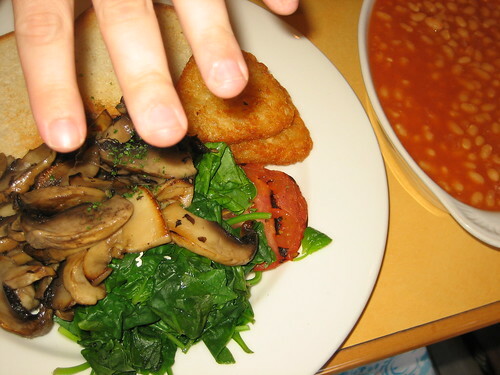 Tiamo's vegetarian big breakfast is eggs, toast, spinach, mushrooms, tomatoes and hash browns. There was elastic in my spinach (the spinach, incidentally, tasted terrible), they forgot A's latte (or something, it was a coffee drink of some description), and they refused to swap out the eggs. I understand why restaurants have a no swap out rule when it's busy, but the restaurant was very quiet and the eggs are like the main component, did they think I was swapping it out for fun? The only thing they would do was not to bring the eggs out. D and I then shared a serve of baked beans, which was massive (and delicious). The hash browns were crispy and fantastic. The mushrooms were really tasty. But I'm sick of having to pay a lot of money and be made to feel like they're doing me a favour, and it's no longer a central location, many members of TBC having moved, so I'll not be back. Last week I was wandering through Woolies (aka Safeway) and saw some ground wattleseed, and decided to try it. Wattleseed is from (Australian) Acacia plants and has a high protein content, but I very rarely see them in recipes and things. Due to its nutritional value, it's been used in bush bread made by Australian Aborigines for a long time, so I decided to try bush food with bush food and give damper a go. Damper is one of those things, everyone knows about it and generally likes it and vaguely knows how to make it, but nobody ever eats it. It originated as a campfire food, because the ingredients were so simple and wouldn't go off before you could use them. You'd just mix it all together and chuck it in a little oven in the fire. I have this feeling that I've had it cooked this way before, but my camping and bushbashing days are long over, so I can't be sure. This is a recipe, but it can hardly be called mine, simply because it's pretty much the same all around, with occasional additions of a tiny bit of sugar, or substitutions of milk for water. Soak the wattleseeds in a little bit of water whilst you rub the nuttelex in to the flour. Then add in the salt. Make a well and pour in the milk and the wattle seeds. Mix in, and then knead thoroughly. Mould into a ball, and bake at 200C for about 35-40 minutes, or until it sounds hollow when you tap it. Leave to cool, and either cut or pull apart. It is good with a little nuttelex melting in, but is also good dry. I love noodles, all the time, so when the zucchini and peanut noodles from the PPK were recommended to D, we decided to give it a go. I think the proportions in the recipe are a bit off, or just perhaps not to my taste. The recipe calls for one pound of noodles (and recommends whole wheat pasta), which is just under a 500g packet of pasta noodles. I would recommend perhaps half a pack, something like 200 or 250 grams. I used angel hair pasta, which I've never used before. I found it very gluggy and sticky, perhaps because I don't usually rince my pasta, something I'm going to try to do now, having had this experience. 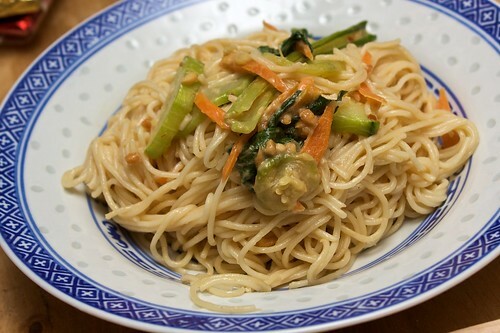 Zucchini didn't seem adequate, given the huge amount of pasta the recipe called for, so I added some carrot and gai lan that I had in my fridge. If I'd had some bean shoots I'd probably have added these also. Overall, I was satisfied with this pasta. It had a fun flavour, and was very quick and easy. I'm not sure I'd make it again though. I love taking cookbooks on the bus so I can spend the busride thinking about new things to try. 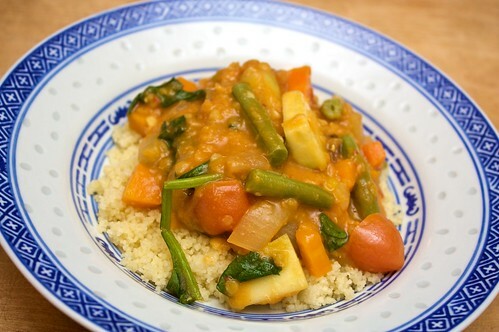 Vegan With a Vengeance is a book nicely sized for PT, and features a moroccan spring vegetables recipe. I don't really know much about Moroccan flavours, and the recipe admits to probably not being authentic, but it was fun to try this mix of flavours and spices. 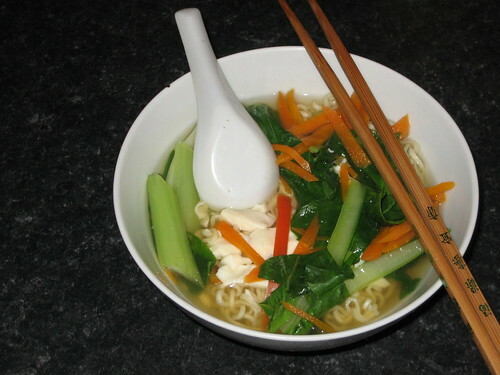 I've made this twice in the last few weeks, it's very easy to make and really tasty.